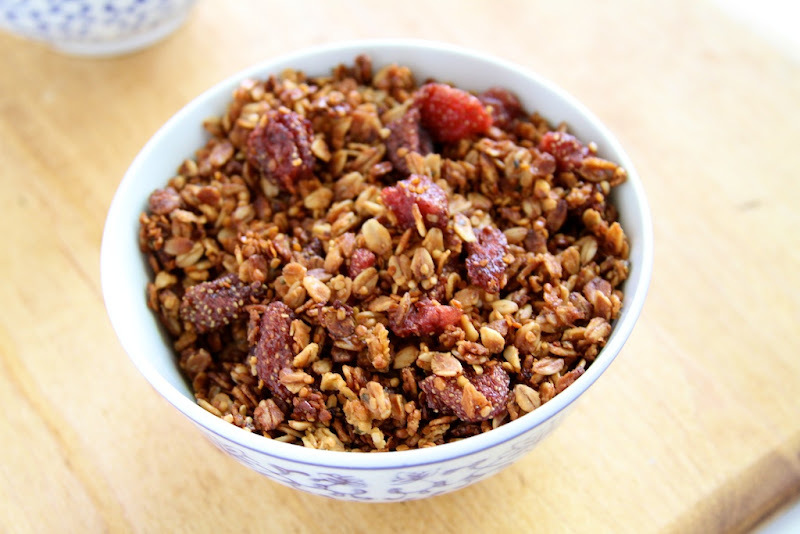 Strawberry Hemp Granola | Naturally. I’m back- movin’ and shakin’. I have become enamored with hemp. If you aren’t familiar with hemp, I suggest you type it into google and read a bit about the health benefits and nutrition (there are too many articles to try and post them all.) I have to be honest though in saying the taste addition of hemp is one of the main factors of why I use it so much. In a large bowl combine the first two ingredients and give a quick toss to combine. In a separate bowl, combine all the wet ingredients and whisk to combine. Pour wet mixture over oat mixture and stir so that every piece is coated. On a parchment covered tray, spread mixture so that it is a think layer. Bake for one hour, stirring every 15 minutes so that the edges do not burn. Once done, let cool for 15 minutes. 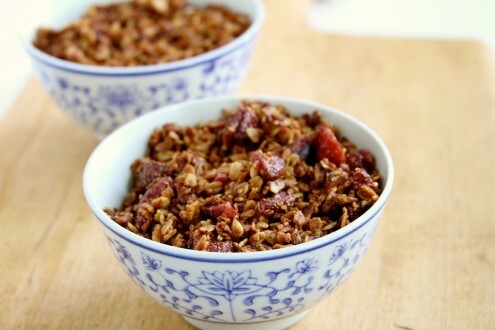 Pour granola into a bowl and toss with dried strawberries. This looks great! Found you on FoodGawker!